Willie Mullins expressed his surprise after Briar Hill destroyed a competitive-looking field by seven lengths to land the Weatherbys Champion Bumper and give the trainer his fifth winner of The Festival. Sent off at odds of 25/1, the five-year-old made a mockery of his odds and punters will surely wonder how they allowed the Ruby Walsh-ridden gelding to go off at such a big price. Briar Hill’s victory completed a 83.5/1 double for both Mullins and owner Graham Wylie on the second day of The Festival. It also gives Mullins his eighth winner in the race. “I thought one of the others might win it because I had four horses aimed for the bumper and this was the fourth of four,” said Mullins. “I wasn’t particularly pushed about bringing him but we did know he had a bit of ability after his debut despite showing nothing at home. I like horses like that though as they tend to surprise you. “I said to Mr Wylie there is no pressure and we are only here to find out how good he is. Even if he had finished 10th, we would have been happy so it’s a big surprise. “Ruby wanted to drop him out because of the early pace and then get him on an even keel. I think a combination of the hill, better ground and a bit of a stamina test have brought out the best in him. The others have all run a bit too free but we’ll see how they are when we get home and make plans from there. “It’s a bit of a shock as I had a couple of good rides earlier in the day and I wasn’t really counting on this guy,” said Walsh. “It didn’t go to plan because I missed the break and had to change plan but it worked out and when I gave him a smack he took off. He was very impressive. “He is no flash harry at home but you don’t mind that if they do it at the racecourse and I think he could be a top horse for the future. He is related to Boston Bob and we have always classed him as a chaser in the making. Briar Hill was Walsh’s fourth winner of the 2013 Festival. Dorset trainer Anthony Honeyball enjoyed his best result at The Festival when Regal Encore finished second of 23 in the Weatherbys Champion Bumper. He added: “The pressure is off now, because they [the McManus family] are very good winners and losers. We’re delighted he’s run such a good race and done himself justice. I did think that if we could get him here in good order that on form he would run well. It’s hard to evaluate bumper form, but the way he won at Chepstow made me confident he would do well if he got a good run through the race. “He’s still a bit keen and A P has to drop him out a bit as a result. Hopefully with time he’ll settle down and we’ll be able to ride him a bit handier, but A P gave him a cracking ride, and it was pleasing to see the horse gallop right to the line. When three of them pulled clear I felt relief that we would be there or thereabouts, and while I was was worried he might fade he didn’t. It’s not a disastrous day. Aidan O’Brien paid his first visit to Cheltenham since 2002, when Istabraq was pulled up in the Champion Hurdle, to saddle Shield, 17th of 23 in the day’s finale, the Weatherbys Champion Bumper. Shield was O’Brien’s first runner at a Jump meeting in Britain since Istabraq, and when he won at Leopardstown 10 days ago he was his trainer’s first bumper winner since The Alamo won at Galway in August, 2004. But, with daughter Sara now riding as an amateur, he will be further renewing his acquaintance with the branch of the sport in which he honed his skills with such as triple Champion Hurdle winner Istabraq before switching to the Flat. The Weatherbys Champion Bumper is the only Grade One National Hunt Flat race to be run in Great Britain and the contest was introduced at The Festival in 1992. During its early years, the race was sponsored by the Tote (1992), Guinness (1993), Bromsgrove Industries (1994), Prestige Medical (1995) and Bi Group (1996). Weatherbys, racing’s administrators, have backed the two mile, one furlong contest since 1997. One of the most fiercely-contested races at The Festival, the Weatherbys Champion Bumper often has a maximum field. A total of 25 horses lined up in 1994, 1997, 1998, 1999 & 2003, while 24, the current safety limit, have come under starters orders in six of the past nine renewals. The smallest line up was in 2000, when Joe Cullen led home a field of 17. Willie Mullins has saddled seven winners - he also rode his first winner of the race, the 1996 scorer Wither Or Which, while his son Patrick was in the saddle when both Cousin Vinny won in 2008 and Champagne Fever scored for the stable in 2012. Four jockeys have ridden two winners apiece - Richard Dunwoody (Montelado (1992), Florida Pearl (1997)), Charlie Swan (Mucklemeg (1994), Joe Cullen (2000)) plus current riders Paul Carberry (Rhythm Section (1993), Hairy Molly (2006)) and amateur Patrick Mullins (Cousin Vinny (2008), Champagne Fever (2012)). The Weatherbys Champion Bumper is restricted to horses aged four to six and five-year-olds boast the best record with 13 wins. Six-year-olds have struck on four occasions, while Rhythm Section (1993), Dato Star (1995) and Cue Card (2010) are the only four-year-olds to be successful. With often little form to go on, the Weatherbys Champion Bumper has traditionally been a poor race for favourite backers, with only three winning in 20 runnings. Liberman is the shortest-priced winner, obliging at odds of 2/1 in 2003. Monsignor is the longest-priced winner, scoring at 50/1 in 1999, while Hairy Molly (33/1 in 2006) and Cue Card (40/1 in 2010) have also triumphed at long odds. Irish-trained horses enjoy a superb record in the Weatherbys Champion Bumper, accounting for 15 of the 20 winners. Dato Star (1995, Malcolm Jefferson), Monsignor (1999, Mark Pitman), Liberman (2003, Martin Pipe), Cue Card (2010, Colin Tizzard) and Cheltenian (2011, Philip Hobbs) are the British-trained scorers. The first winner of the Weatherbys Champion Bumper was Montelado, who achieved what is thought to be the unique feat of winning two consecutive Festival races. The Bumper, now run on Wednesday, was originally the last race of The Festival. Montelado went on to win the opening race of the The Festival in 1993, the William Hill Supreme Novices' Hurdle. 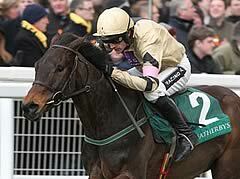 Willie Mullins partnered the first of his seven winners, Wither Or Which, to victory in 1996, while Ruby Walsh recorded his first Festival success in the race on Alexander Banquet in 1998.